Take the bite out of the winter cold with our latest Slazenger Fleece with Logo. Frost will be a big problem this winter along with snow, so what better way to promote your business brand name and logo, as well as keeping customers toasty warm this winter? Perfect for handing out at business conventions and trade fairs!! We have different options available of half zip or full length zip. Personalise your logo brand name by an embroidered stitch - of upto 5000 stitches for your company logo! Ensure customers and clients keep warm this winter with this perfect promotional giveaway or business freebie gift. As an act of good-will, what better way to expose your company brand name and set in motion the reciprocation needed for future business. Our Logo Branded Slazenger Fleece is anti-pilling treated fleece, and 100% polyester and will keep you toasty warm and cosy - perfect to take the bite out of the winter frost and snow. 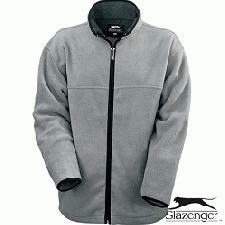 Original Slazenger™ 100% fleece, weight: 260/280gsm, contrast details and raglan sleeves. Zip pocket on sleeve. For a FREE QUOTE please fill in our contact form regarding our Slazenger Fleece with Logo and we'll be able to help you.